This year is the fiftieth anniversary of the ‘Red Referendum’. In Prussia — the biggest German state which included Berlin — the Social Democrats had been in power since 1919. Its reformist leadership had presided over a devastating economic slump and the rise of the fascist party supplied with unlimited funds by the big monopolists. Over the whole of Germany there were 6 million unemployed; it was estimated that 15 million Germans were in dire poverty, dependent on public charity and living on potatoes and green vegetables. The Social Democratic government had killed 61 workers in Berlin who demonstrated on May Day 1929. It had passed legislation against the Communist Party and banned the CP military organisation. In 1931, the Nazis were sweeping everything before them in elections and could soon be the biggest party in the Prussian parliament. The Social Democrats manoeuvred so as to continue governing. The Nazis demanded a referendum as the only way they could legally remove the Social Democratic government. The German Communist Party leaders at first opposed the referendum. Then, under the instructions of the Stalinist leaders of the Soviet Union, they campaigned for a vote to bring down the Government, which the Nazis were demanding. In the event, the Prussian workers, with class instinct, refused to vote with them and the Nazis did not get half of the 25 million votes they needed. The ‘Red Referendum’ (a title proudly bestowed on it by Stalinist leaders) has gone down in history as one of the crimes of ‘Third Period’ Stalinism, a milestone in the degeneration of the Communist International. We recall it here, not because it is the fiftieth anniversary — although that anniversary could be used for a deeper study of the many lessons of this period — but in relation to the present policy of revisionist groups in Lambeth. There are, of course, a number of important differences in setting, but there is agreement in essence between the policy of the Stalinists of yesterday in the ‘Red Referendum’ and revisionists of today. And there is one important difference in setting which, among others, speaks against the revisionists. The revisionist groups line up with reactionary forces seeking a removal of Lambeth Council even though by contrast with the position of the Social Democratic government, Lambeth has the merit of attempting to organise struggle against capitalist attacks. On the basis of ’no rate increases’ raised to an abstract principle, the revisionists enter into a furious struggle against Lambeth. This struggle, of course, is determined completely outside of place and time, completely outside of the relationship of forces and — of course again — outside of the actual movement of the working class to power. To say that the revisionists ignore the relationship of forces and the movement to power would be wrong. They are repelled by it. Their subjective assault on the WRP for posing the question of Community Councils expresses their repulsion. Likewise the adventurist posturing — the locking for a ‘thunderflash’ to blow everything up. For the ‘Militant’ group, Lambeth is also the disruption of the even evolution of processes within the Labour Party. But here comes the most revealing aspect of the policy of these phrasemongerers. Without Community Councils, without any national movement of councils and workers, where are these confrontations, these Clay Crosses, meant to lead? Well — to another Labour Government, of course, somehow and sometime! After a moment’s thought every serious worker, trade unionist and Labour Party member, will agree that to pick a direct fight of the nature of Clay Cross today, without a national movement of the working class and sections of the lower middle class who can be brought into struggle, would bean adventure. We are in a period when the political movement of the working class is toward independent activity, a heightening of consciousness of its own strength, and a movement away from centring its aspirations on Parliament. This is not to say that the revolutionaries will not still have to go through many varied and living experiences with workers directed towards Parliament or reformist leaders. But the central question becomes one of Community Councils as a flexible force to unite the old organisations of workers with the new ad hoc Committees that will spring up everywhere. The preparation for power in Britain is the movement of forces against capitalist attacks, not on the electoral field, but in the areas, in the places of work, and the communities. In this, a development to link councils with tenants, unions, communities in struggle is central. The initiative of Lambeth is important because it focuses forces in an area and links them nationally. Characteristic of this period is that workers feel instinctively the need for organised, united, national power. For this reason the admiration of Polish workers is widespread. Workers hesitate before and withdraw from, the individual, and the economic dispute. They feel the immensity of the tasks and the inadequacy of the official leadership, things which pose for them the need of a leap to become leaders themselves. Today it is not a question of a repetition of Poplar or of Clay Cross, but a question of what we learn from them in the light of the concrete circumstances in which we struggle today. In 1921, George Lansbury, a leader of the Labour Party, and another 29 councillors went to jail for contempt of court for refusing to collect an amount in their rates for the London County Council and other bodies. They were demanding ‘equalisation of rates’ which would mean that richer boroughs such as Kensington would assist poor boroughs like Poplar, where poor relief for a massive number of unemployed was paid out of the rates. Their rates strike and the mass demonstrations which accompanied their jailing won an increase for the poorer boroughs from the rates equalisation fund. But, like every reform in a period of capitalist decay, it meant that while capitalism gave with one hand, it took something away with the other hand. The legal powers of the central state were strengthened. It was made possible for a Commissioner to be appointed by the state to run the affairs of a council which defaulted. It needs to be considered that Poplarism took place at a time in 1919 when the working class had already developed a certain confidence in mass action and Councils of Action had pushed back a government threatening war against the Soviet Union. Ten thousand workers marched to the police station with some of these councillors. We are now just at the beginning of a movement which is going to be wider, deeper — and more conscious — than this. But we are at the beginning. Above all, since this period there has been an advance in centralisation and the dominance of the state over municipalities. After the defeat of 1926, the moves against Poplar and other councils (including those who had paid relief during and after the General Strike) ended in an Act in which councillors could be surcharged and disqualified. Later, in 1972, a Tory Government passed the Local Government Act which declared that if an auditor certifies that a deficiency of more than £2,000 is due to wilful misconduct then a councillor is automatically disqualified for five years. Clay Cross councillors refused to raise council rents under the direction of the Tory Housing Finance Act and paid wage increases in defiance of the last Tory Government’s pay freeze. They were subject to special audit, surcharged, bankrupted and disqualified. Support for Clay Cross remained on the plane of sympathy resolutions and despite its pledges the Labour Government of 1974 did not lift the penalties, nor alter the law. Calls for one to six Clay Crosses made by the Workers Socialist League (WSL) are not leadership but thoughtless and dangerous idiocy. As the News Line correctly showed, Clay Cross was a defeat. To say that is to imply no criticism or denigration of the courage of Clay Cross councillors. They did not have the advantage of their own later experience. It is not a question at all of whether to face penalties or jail. It is a question of the state of the fight and, as Trotsky says, the ‘actual struggle of the classes for power’. The whole question of council cuts is one that has to be taken in the context of the world crisis and the contradictory movement of the historically conditioned consciousness of the working class, in that crisis. Capitalism in its death agony removes all rights and removes the foundation of the ‘Welfare State’ developed to hold off revolution after the war. The Tory Government is speeding up that process, meanwhile stripping municipalities of all historic powers and rights. They increase the power of non-elected bodies, take away any power to enforce health, safety or planning regulations on capitalist firms and increase the power of slum landlords, leaving these councils only with the power to carry out wholesale attacks on the working class population. This merges with the crisis of community and social bodies affecting a whole layer of the lower middle class who entered social work in the boom and who are being shaken up into a fight. 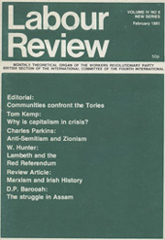 Involved also is a consciousness of ‘lost rights’ which has traditionally played a role in British class struggles. The crisis of capitalism here at one point feeds the crisis in the Labour Party where councillors are faced practically and concretely with the choice: either they lead and mobilise the working class against the government or they help the government to destroy the working class. The crisis strips bare the fact that there is no vestige of a possibility that they can be agents of reform, or defenders of welfare rights, by the manipulation or allocation of municipal finance. Here Lambeth Council took an absolutely progressive action which determines our support and assistance. The rates question is completely secondary to developing a national movement of councillors, unions and community groups, a movement which can help to push forward Community Councils in areas but a movement which is now at various levels of development. The revisionists, with a deep pessimism about the working class as it makes its ponderous movement towards revolutionary politics, are incapable of thinking about intervention in Lambeth in relation to the development of that class. The decisive difference between the WRP and these revisionist groups is in that the WRP starts with the working class as the lever of history and seeks by its intervention, its strategy and tactics, to assist its development and deepen an understanding of it. The revisionists can go from opportunism, sinking to the level of pure and simple trade unionism, to an adventurism which looks for a single issue that can jack up the working class — as in Lambeth where the rates issue becomes something that can lead to attacks by the state. Of course, this results in the most radical-sounding phrases. But where it is a question of proving correctness of leadership in struggle they succeed only in exposing their own shallowness. That a furious dispute has broken out with the revisionists over Lambeth is something that can only be welcomed. For many years, revolutionaries have foreseen the danger that in a period of political ferment, the various revisionist currents could come together with Stalinists and left reformists in an opportunist lump that would confuse and mislead the working class. It is to be welcomed that the bankruptcy of these tendencies can be exposed before any consummation of that development. The questions are being posed in terms of strategy and tactics of struggle in such a way that the revolutionaries can rout the phrasemongers. It gives an opportunity for developing respect for the party among sections of the Labour Movement who have only just begun to move away from reformism. In this regard it widens and deepens a relationship with the centrist currents that can overcome very rapidly what were seen as the revisionist dangers of the future. The superiority of the Marxist party is not just that it can show the working class better arguments and analysis, or better resolutions. It can certainly do that. But its superiority is in leadership in class struggle, in showing the correctness of its tactics and strategy in leading to the taking of power.